A full 79 percent of voters responding to a recent survey support “streamlining or expediting the permitting process to improve, modernize, or construct critical energy infrastructure like renewables, pipelines, power plants, transmission lines and export facilities,” according to a new report by the U.S. Chamber of Commerce Global Energy Institute. The survey of likely 2020 voters is part of GEI’s new “American Energy: Cleaner, Stronger” initiative, which promotes continued economic growth and environmental progress through technological development and innovation in the energy industry. Recent executive orders reduce barriers to infrastructure development. The survey results echo the sentiment behind President Trump’s newly announced executive orders revising policies to make it more difficult for state agencies to abuse the process and interfere in pipeline development. The action takes aim at states like New York that have continued to stymie natural gas pipeline development, despite the economic toll of limiting reliable American energy supplies to the region. An earlier Global Energy Institute report revealed that “Keep it in the Ground” efforts have cost the nation nearly $92 billion in GDP, $20.3 million in state and local tax revenue, and 728,079 jobs lost. Energy companies are invested in environmental progress. In fact, America is already reaping the environmental benefits. 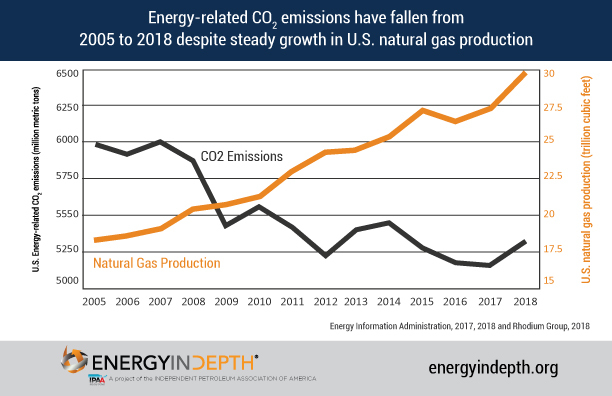 Thanks to technological advancements and America’s impressive natural gas production, the United States has reduced CO2 emissions by almost 800 million tons, the largest in the history of energy. In 2018 alone, the increased use of natural gas in electricity generation helped the country avert 40 million tons of emissions, highlighting strides to improve energy efficiency. Perhaps these clean-air benefits coming directly from increased natural gas development are the reason only 21 percent of voters surveyed in the GEI report support the decidedly anti-American energy Green New Deal proposed in Washington. American energy makes us cleaner and stronger. GEI’s report reveals broad support for the American energy industry – 73 percent of voters support a “cleaner, stronger energy agenda” – and for reducing regulatory burdens that hinder growth. Trump’s executive orders help clarify Clean Water Act guidance and provide a pathway for energy companies to continue to innovate, strengthening our economy, energy security, and environmental progress.